Sunday, April 14, at 7 p.m. Led since 1989 by violinist and Artistic Director Richard Tognetti, this internationally renowned 18-piece string orchestra performs classical masterworks as well as new commissions and innovative collaborations across art forms. 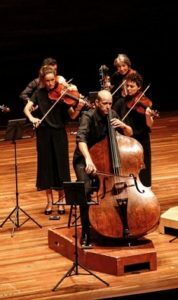 Members use both modern and historic instruments, and only the cellists are seated, adding to the air of energy and individuality. This program of Bach, Mozart, and Beethoven features American-Israeli pianist Inon Barnatan.